Note that not all screenshots show the new (from ver 1.93) CIT Analysis and Add Cit icons. 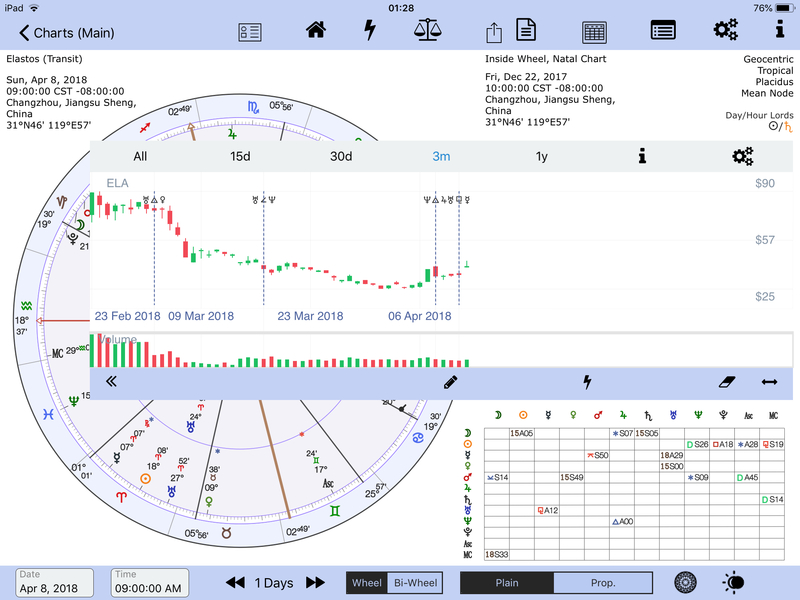 From ver 1.93 the date label for long-press over the financial chart is positioned at the top for a clearer view. 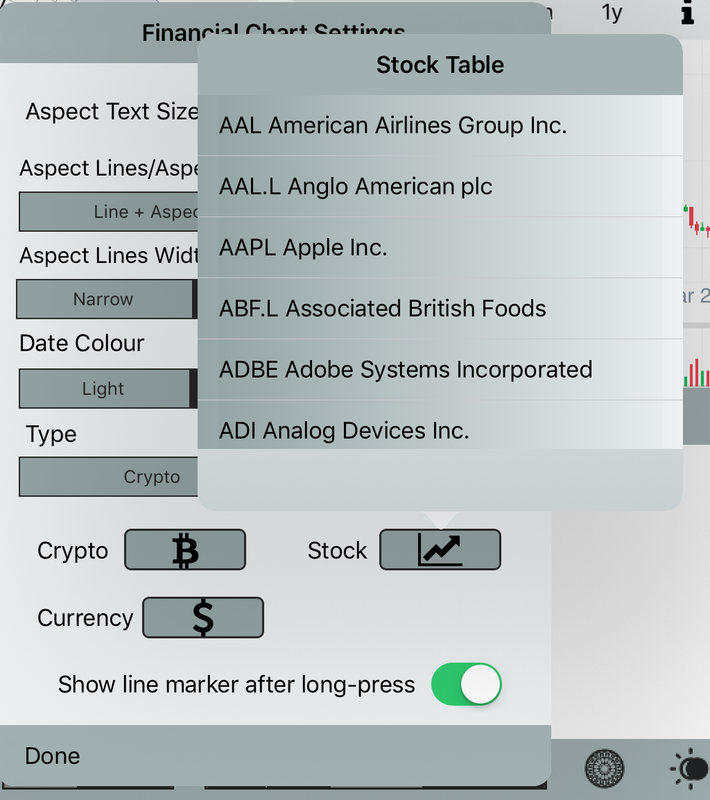 Financial Stock Data – (up to 20 years data). Please note the Remove vertical lines button has been removed/deleted. Extended zero values Crypto data. Useful to see up-and-coming aspect hits. Select Full Landscape #6 – Finance, if not already selected. 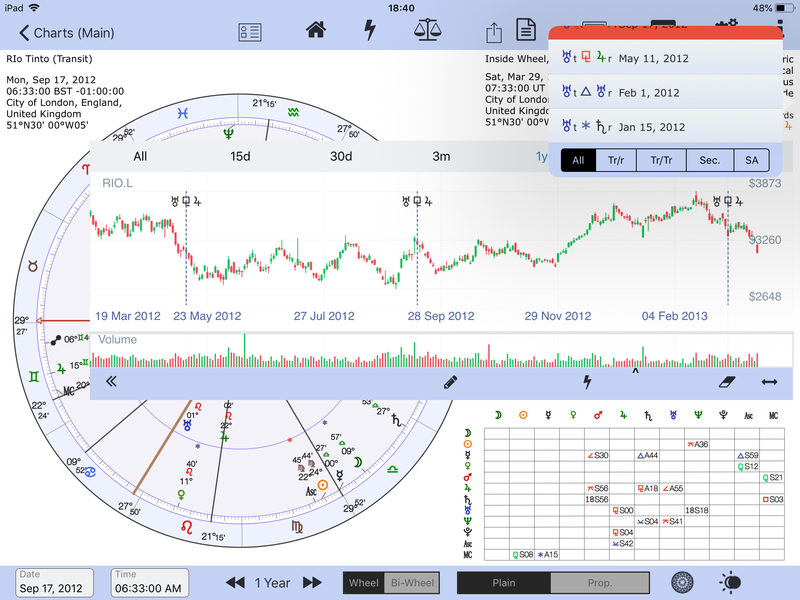 Ensure the stock or crypto currency matches the astro chart. 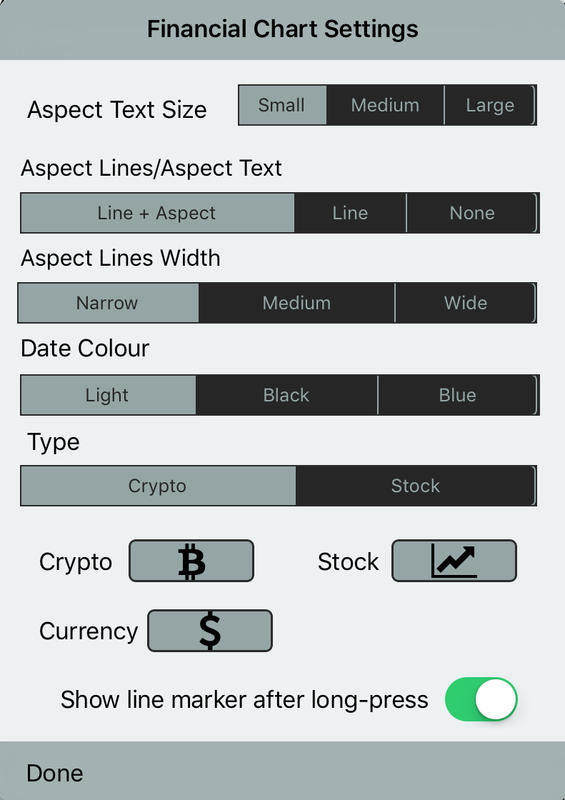 Tap Settings (Cogs) to change your data selection – see screenshot: Layout of Financial Chart menus above. Tap an aspect in the Aspect Hit table. 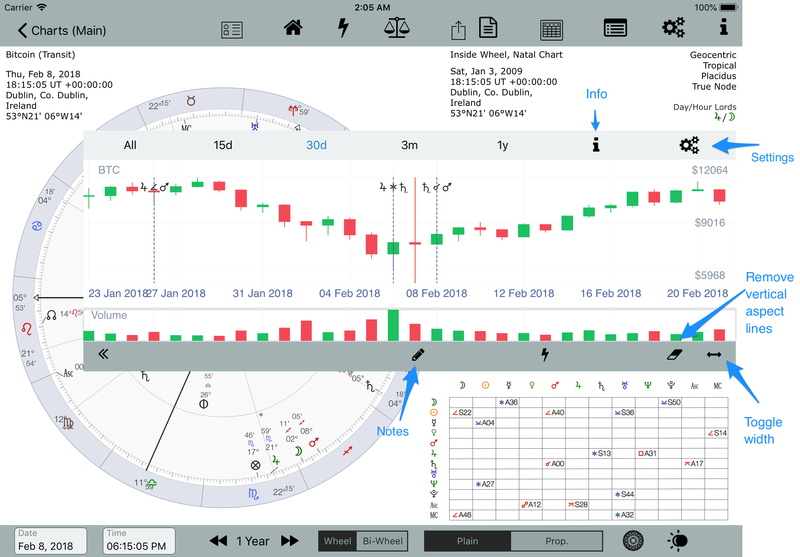 The financial chart will centre the data (using 30 days) to show the aspect more clearly, and the astro chart will automatically adjust to the date of the aspect. If eg, the aspect is a transit to a radical point, the chart will reflect this by changing (if necessary) to the appropriate bi-wheel. If the aspect is a transit to transit the chart will reflect this by changing (if necessary) to a single-wheel. 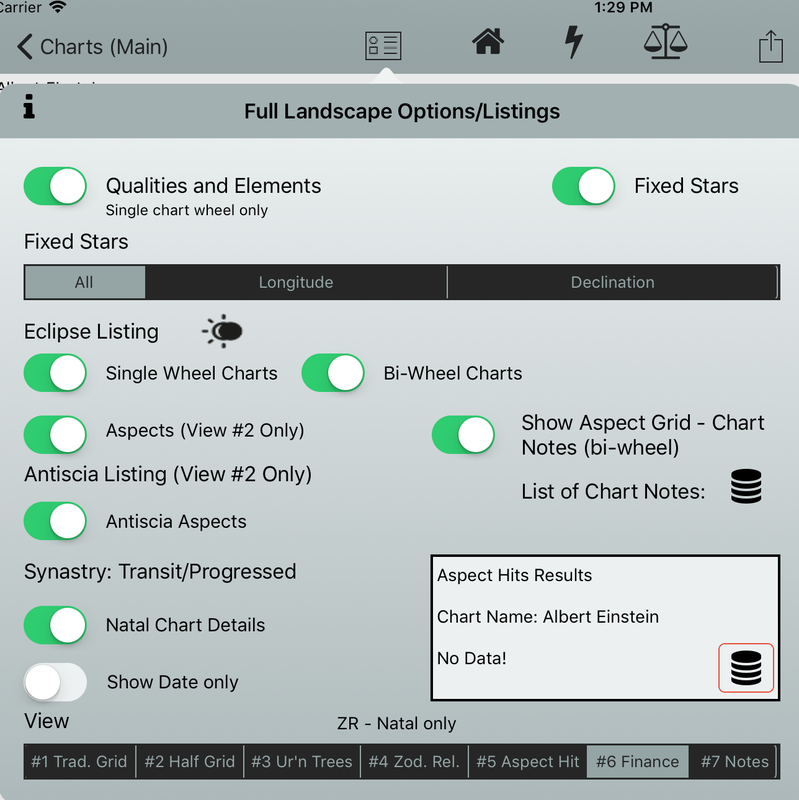 The aspect grids will change according to the chart’s type, single or bi-wheel. Similarly for Sec. Progs, and SA directions. Please note that with a long-press over either aspect grid (single-wheel chart the aspect grid is shown on the left, bi-wheel the aspect grid is shown on the right) the Aspect Table will pop-up which can be useful. 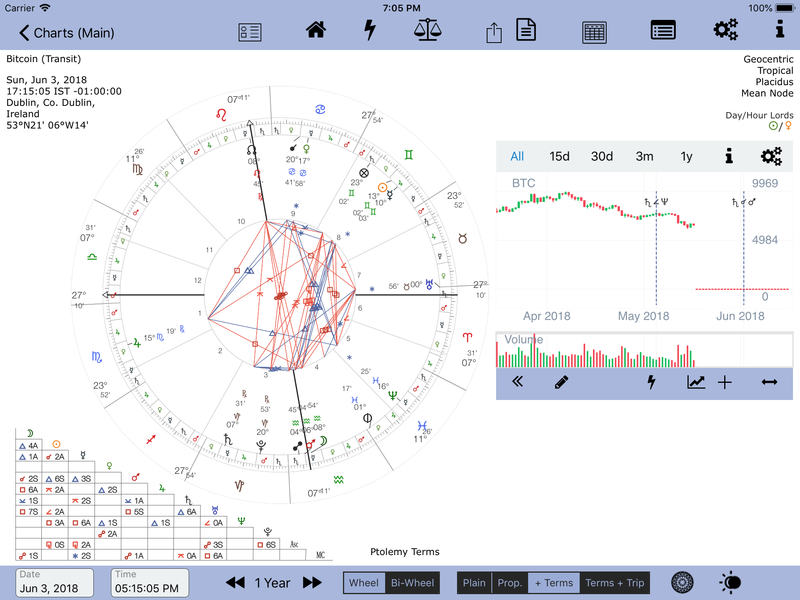 Bitcoin Aspect Hits – Sync to Astro Chart. 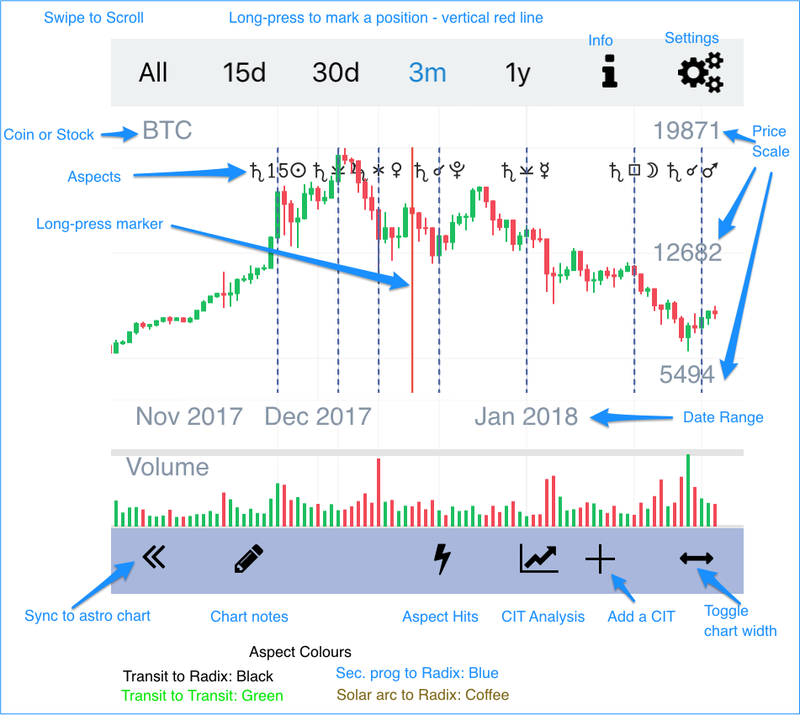 Bitcoin: Sync charts with long-press. First-time requires button to be tapped twice. Crypto currencies trade 24/7, stocks trade Monday to Friday, and don’t trade on some public holidays. What if an astrological aspect occurs on a Saturday or Sunday? A vertical line and the corresponding aspect can not be shown to correspond with the stock data, as there isn’t any. How does AC resolve this dilemma? AC uses a simple algorithm: if an aspect occurs on Saturday or Sunday the aspect is shown as being exact on the Monday and the aspect’s vertical line is drawn to correspond with Mondays data. If no data exists because of say a public holiday and the exchange is shut that day then the aspect will not be shown. When analysing a chart against stock data this should be taken into account.